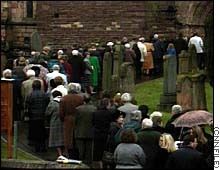 LONDON (CNN) -- A madman who shot to death 16 children and their teacher at a primary school in Dunblane, Scotland, on March 13, 1996, left their families bereft and changed a nation forever. "It was one of the most shocking things that has ever happened in this country and it united the country in a feeling that we had to do something," said Gill Marshall Andrews of the Gun Control Network. "And I don't think that it would have been possible to make the kind of progress that we have made without that tragedy." The progress: A year and a half after the massacre, the British Parliament passed a ban on handguns larger than .22-calibers. 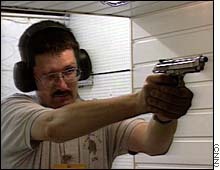 There were some 200,000 legally registered handguns in Britain before the ban, most owned by sports shooters. Britain never has had the kind of "gun culture" that the United States has. The British have no right to bear arms. That is seen as a role best left to the police, and most of them, in fact, are not armed. The public generally supports the ban, with most saying they see no need for guns. Others say the ban deprives legitimate sports shooters of their hobby and "demonizes" them. "Just because we enjoy shooting doesn't mean that we think everybody should be free to go into any shop on any street corner and buy a gun without having some suitable checks," said firearms expert Michael Yardley. "There is obviously a balanced position. What we don't like is being scapegoated." Other critics say the handgun ban misses its target. Less than one-half of one percent of the crimes committed in England and Wales involve guns -- and most of those involve illegal weapons. By police estimates, there are 2 million illegal weapons, and some say Europe's relaxed frontier controls mean that problem will grow. Police records for 1996, the most recent available, show 25 murders in Scotland involved firearms: the 17 at Dunblane and 8 others. In England and Wales, the total was 49. In the United States, there were some 34,000 deaths involving firearms -- some 15,000 homicides and more than 17,000 suicides. "We have some of the tightest gun laws in the world and that is reflected in a low gun death rate and a low gun violence rate," said Andrews. "It shouldn't be forgotten that on an international basis there is a very clear correlation between the numbers of gun deaths, gun injuries, and the gun laws." It will be a few years before the ban's effect on crime can be measured. Critics say it will be negligible -- the low firearms mortality rate existed before the ban and most guns used in crimes here weren't registered legally anyway. But others believe the message it sends about what kind of society Britain wants to be is immensely important -- one reflecting the belief that widespread ownership of handguns is not compatible with a sane, civilized or safe society.